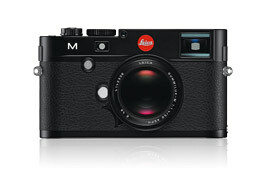 Leica M review: How does the new 24-megapixel CMOS sensor in Leica’s latest rangefinder perform? Retiring previous M9 and M9 P versions this latest model – known simply as the Leica M, sits alongside the Leica M-E Typ 220 as the two full frame cameras in the German manufacturer’s renowned M series. With a list price of $6950 (body only), streamlined functionality and rangefinder viewfinders Leica cameras are unusual in the digital era but they continue to hold reverence with some photojournalists. Quality engineering using brass and magnesium combined with simple controls and petite proportions make the M solid as well as portable and quick for reportage photographers. The rangefinder style of composition provides a rough indication of framing using guidelines in the viewfinder that adjust as you change lens. This is done via a sensor in the body to read the lens profile and allows the image processor to apply lens-based corrections as files are saved. Compatible with both M mount as well as Leica R lenses via the $310 R Adapter M, there’s a wide choice of high quality Leica optics available for the M, but it only offers manual focus. The new 3.0in 920k LCD does feature live view for more precise framing however and makes shooting with macro or telephoto lenses a realistic possibility. 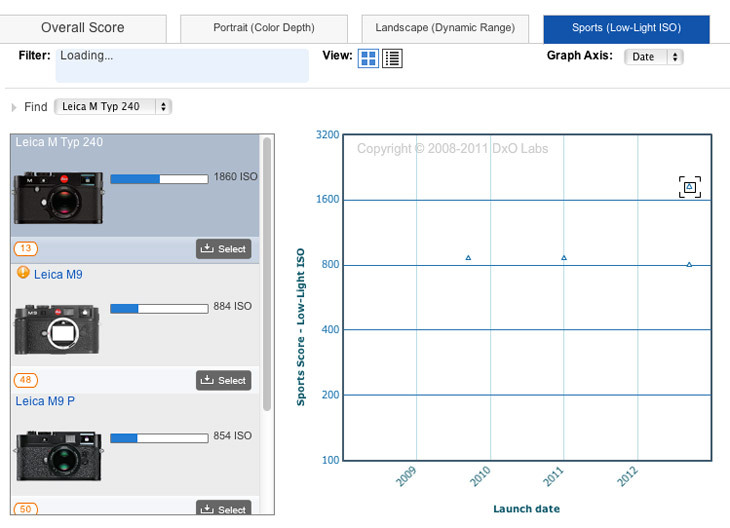 Live view also offers a 10x magnification for precise manual focus. Despite remaining true to simplicity this latest model does incorporate a few updated specs such as HD video, a 100 – 6400 ISO range, 3fps burst shooting and compatibility with the $465 EVF2 viewfinder, which plugs into the hot shoe, but there’s no built-in flash. Lets find out if the new 24-megapixel CMOS sensor can catch up with the latest DSLR competition. 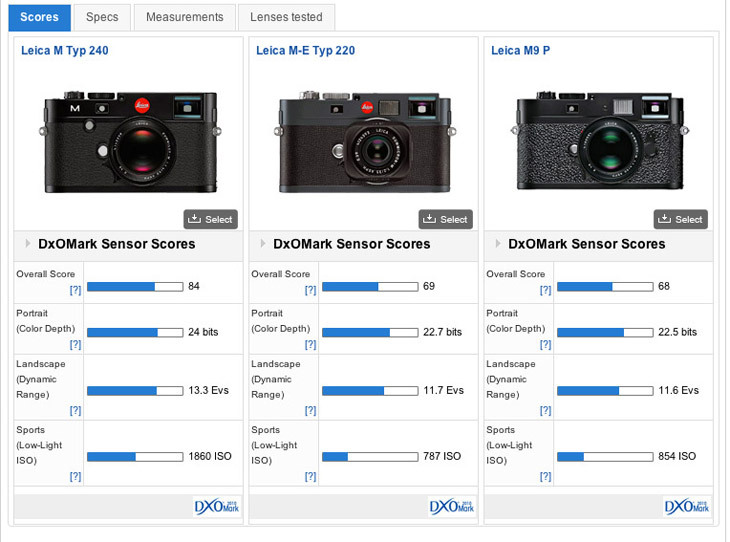 An Overall Score of 84 ranks 8th for all full frame sensors on the DxOMark database placing the Leica M’s new 24-megapixel CMOS sensor in to the top ten. Achieving an overall DxOMark Sensor Score of 84 the Leica M ranks 11th for all sensors on database and 8th overall for full frame cameras. Ahead in the full frame category remain the latest generations of full frame Nikon and Sony cameras but the M’s new CMOS sensor does just nudge out Canon DSLRs. Its individual category rankings are all down on 11th place however making it a good all rounder without a particular strong point. A Portrait (Color Depth) score of 24 bits places the Leica M 21st, a Landscape (Dynamic Range) score of 13.3 Evs is 17th and its Sports (Low light ISO) is a bit off the pace with the best in this class with a rating of 1860 ISO placing it 13th. During testing we did also observe under certain lighting conditions the problem of colour shading, which was low but noticeable when using certain lenses. Overall however though this is a significant improvement in image quality for the Leica M thatseries and puts itLeica back in the hunt with the full frame competition. Placing 11th overall but 21st for Dynamic Range, 17th for Color Sensitivity and 13th for Low-Light ISO demonstrates the new Leica M is a good all rounder but not particularly strong in any one category. Note: Since testing the M running firmware version 1.0.2.0 Leica have updated to version 1.1.0.2, which provides a small improvement for video quality, lens support and stability. 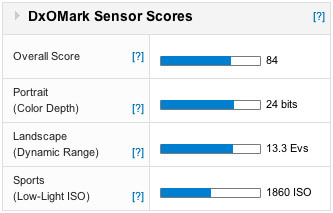 A boost in the DxOMark Overall Sensor Score to 84 points compared to 69 points for the M-E Typ 220 equates to +1 Stop better image quality overall for the new Leica M.
The 18Mp CCD previously used in Leica M rangefinders hasn’t fared well in our tests ranking towards the bottom for full frame sensors. The new 24Mp CMOS model is a big improvement however boasting 6 million more pixels than its predecessor and delivering a 1 Stop improvement in image quality, too. With a +1 Stop improvement for both Color Depth and ISO, as well as an impressive +1.6 Stops better Dynamic Range, it seems switching to a CMOS sensor was certainly a good move for Leica. It’s interesting to note too that no RAW smoothing is applied to files from the new model, as was previously the case from ISO 400 on earlier versions. 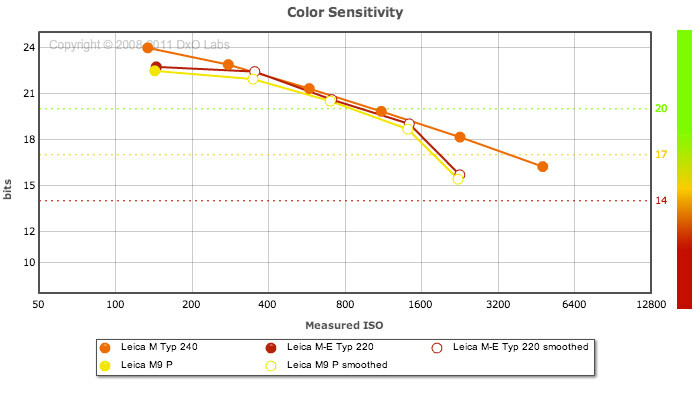 An optimum Color Sensitivity Score of 24 bits is not only +1 Stop gain over previous Leica M cameras but colour on the new Leica M is more consistent at higher ISO sensitivities, too. Dynamic Range on the new M offers a significant +1.6 stop improvement over its predecessors delivering better results at ISO6400 compared to the Leica M-E Typ 220 at its max sensitivity of ISO 2500. One of the weakest aspects of previous Leica M digital rangefinders was its DxOMark Scores for Low-light ISO, which has been improved by +1 Stop on the new 24-megapixel CMOS sensor. 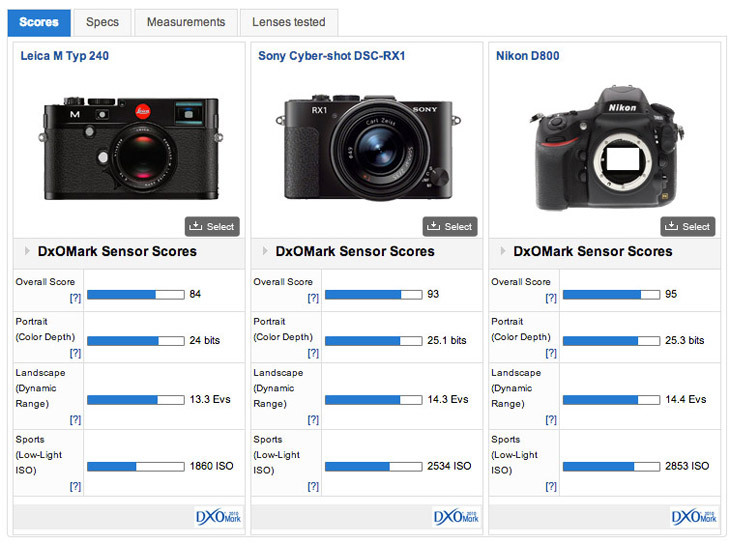 Despite a big step forward for image quality DxOMark Sensor Scores for the Leica M indicates the new 24-megapixel CMOS sensor remains a little behind the best full frame sensors available. Two of the best full frame sensors we’ve tested in the fixed lens Sony RX1 and Nikon D800 DSLR offer a +2/3rds of a Stop image quality overall compared to the Leica M. Drill down into the different categories and the superior RX1 and D800 sensors deliver + 2/3rds of a Stop better Color Depth and Low-Light ISO performance. 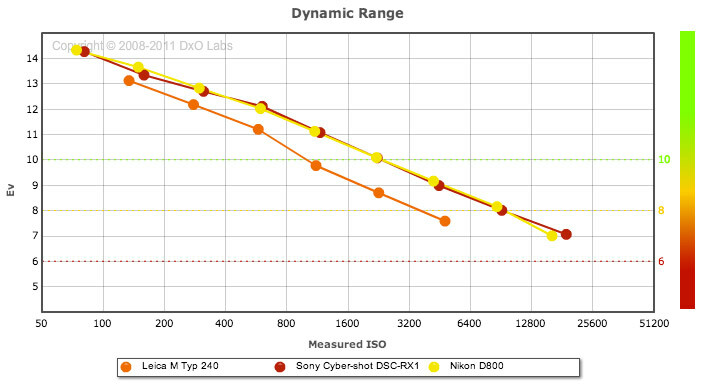 The Leica M’s measured base ISO of 134 compared to ISO 81 and ISO 74 for the RX1 and D800 respectively mean the Sony and Nikon cameras have an immediate advantage and deliver +1 Stop improved Dynamic Range overall with scores of 14.3 (RX1), 14.4 Evs (D800) and 13.3Evs (M). As sensitivity is increased on all three cameras Dynamic Range drops at roughly the same trajectory up to ISO800 where the Leica M takes a further dip. The impact of this is good Dynamic Range of 10Evs and over is only achievable on Leica M up to ISO1600, while the RX1 / D800 are good until ISO 3200 and these better sensors offer the same Dynamic Range at ISO 25600 as Leica M at its maximum sensitivity of ISO 6400. At base ISO the RX1 and D800 record +1 stop better Dynamic Range than the Leica M and the gap widens as sensitivity is increased with the M offering the same results at ISO6400 as the RX1/D800 at ISO25600. 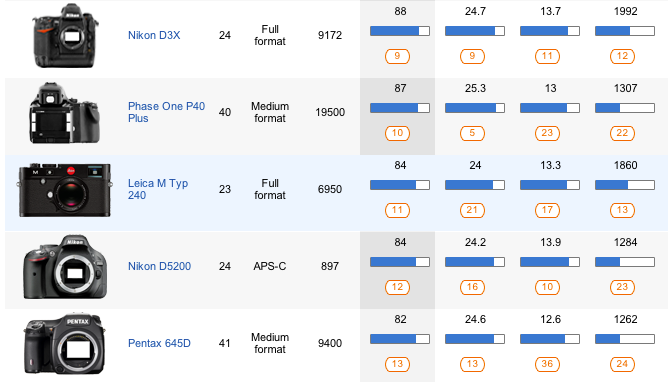 Nudging out the Canon 1Dx overall and not too far off the D4 pace the Leica M has made good ground on the full frame competition but there are key differences in the category scores, which makes interesting reading. Compared to the full frame sensor in Canon’s flagship DSLR, the 1Dx, the Leica M just wins overall with 84 points to 82. For Color Depth there’s little in it with 24 bits for the M compared to 23.8 bits for the 1Dx, so it’s left to Dynamic Range and Low-light ISO to separate them. 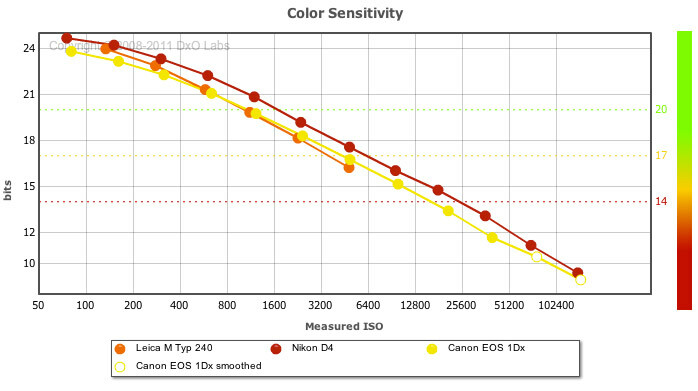 At base ISO sensitivities the Leica M offers significantly improved Dynamic Range +1.5 Stop better than the 1Dx, although this changes quickly as sensitivity is increased. While the 1Dx delivers consistently good Dynamic Range of around 11.8Evs up to ISO 800 the Leica M performance drops markedly as sensitivity is increased and by ISO 800 the two cameras are the same. The trend persists past ISO 800 too where the Leica M’s Color Sensitivity continues to drop rapidly and the 1Dx offers better Dynamic Range at ISO 25600 than the Leica M at ISO 6400. 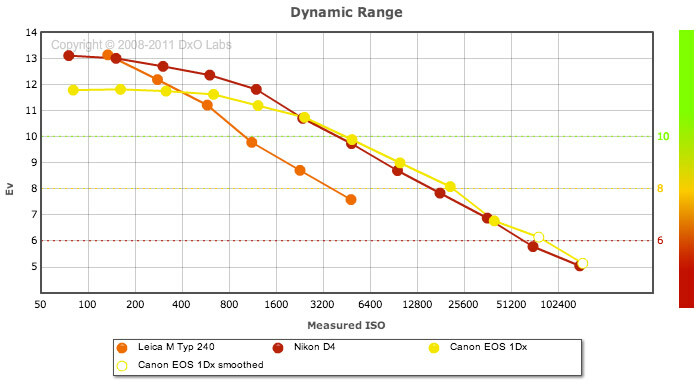 Nikon’s top end DSLR the D4 ranks 1/3rd Stop better than the Leica M overall scoring 89 points compared to 84. The D4 is also ½ Stop better for Color Sensitivity at base ISO with 24.7 bits to 24 bits, but as the Leica M’s performance takes a dip as ISO sensitivity is increased the D4 offers +2/3rds of a Stop Color Sensitivity at ISO 1600 compared to the Leica M at the same sensitivity. 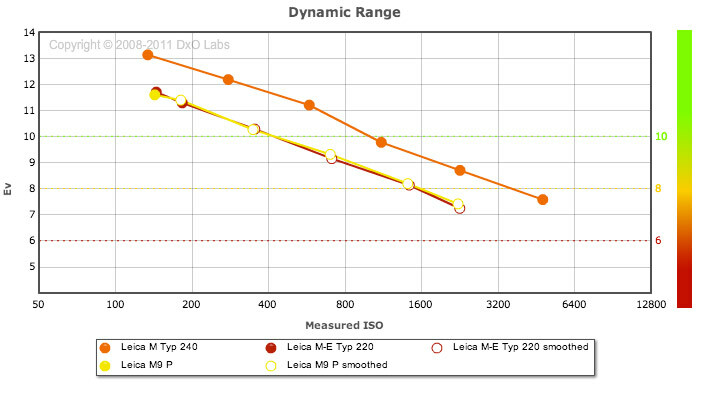 While the D4 and the Leica M have similar Dynamic Range at base ISO sensitivity of 13.3Evs (M) to 13.1Evs (D4) the same pattern emerges as sensitivity is increased, so while good Dynamic Range of +10Evs is possible on the Leica M up to around ISO 800 the D4 delivers the same results up to ISO 3200. No doubt you’ve picked up on the pattern here that while the Leica M can deliver comparable results at base ISO it struggles at higher sensitivities. 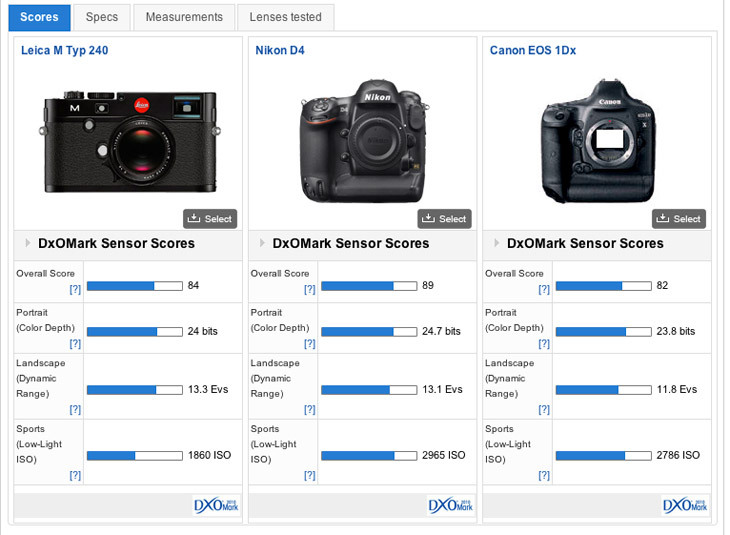 With a DxOMark Low-light ISO score of 1860 ISO (M) compared to 2965 ISO (D4) and 2786 ISO (1Dx) the rangefinder offers around -1 Stop ISO performance compared to these flagship DSLRs. Although at base ISO the Leica M fares well against the competition for Dynamic Range its top score of 13.3Evs drops quickly as sensitivity is increased compared to the more gradual decline on the D4 and 1Dx. The same trend doesn’t occur with Colour Sensitivity however where results from the Leica M follow a similar curve to the D4 and 1Dx despite a minor dip at ISO800. Featuring a new higher resolution sensor and updated functionality expectations are high for the new Leica M and it doesn’t disappoint. Although remaining true to their ‘no gimmicks’ approach the addition of an improved LCD screen with live view, as well as the increased ISO sensitivity range are welcome additions that update Leica’s digital rangefinder for the modern era.